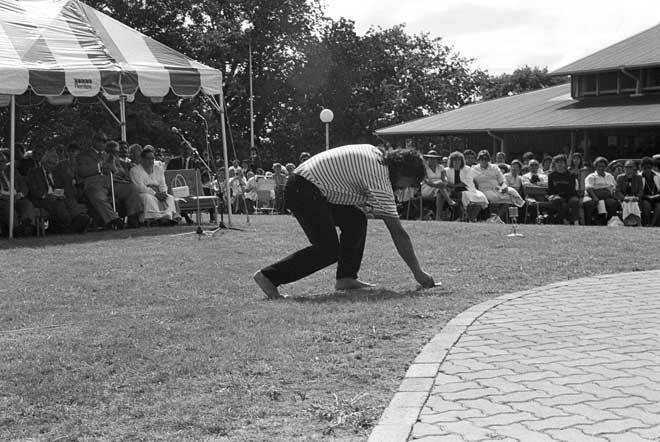 During the 1988 opening ceremony for Waipapa, the University of Auckland marae, Pita Sharples (Ngāti Kahungunu), then a university staff member, picks up a koha left by a visiting party. The custom of placing a koha (ceremonial gift of money) on the ground between the hosts and visitors may refer to earlier times when the koha was in the form of foodstuffs and other bulky goods. This custom also means that the act of giving the koha is highly public and open, in keeping with its ceremonial nature.